Dr. Charles Thompson, Professor of the Practice of Cultural Anthropology, is the director of Duke's Benjamin N. Duke Scholarship Program as well as the undergraduate program at the Center for Documentary Studies. 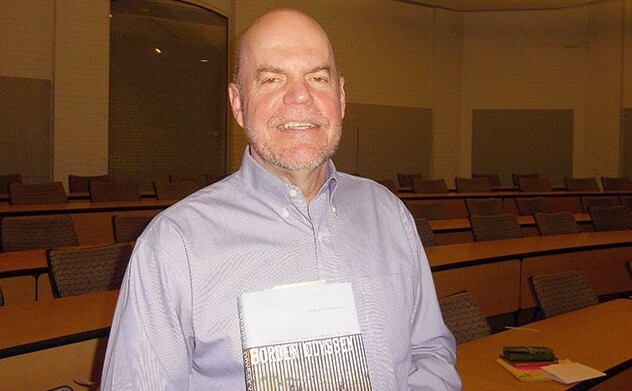 Last Tuesday March 1st, Charlie Thompson, author of Border Odyssey: Travels Along the U.S./Mexico Divide (University of Texas Press 2015), met with students in the Department of Foreign Languages and Literatures to discuss his travels along the border between America and Mexico. Accompanied by Hope, Charlie followed the border all the way to California, documenting experiences and photographing the border and people on the other side of it. His trip involved run-ins with border security, meeting the Braceros who lined up for portrait-style photographs one by one, and a young man sliding through the fence to collect a soccer ball before returning to a party on the other side of the border. Charlie’s visit and talk was organized by Spanish professors Shelley Garrigan and Jordi Marí. It is part of the Department of Foreign Languages and Literatures’ commitment to provide NC State students with opportunities to engage in academic debates that enrich our community by improving our understanding of how people around the world interact, migrate and express themselves. More information on Charlie’s many projects and publications can be found by visiting his website.